Dear Asad: Should I quit my job to pursue my father's business? Ask Asad: How do I overcome the constant sullenness of everyday life? Dear Asad: Should I just stay his 'friend'? Ask Asad: My husband wants to end our marriage, how do I convince him against it? Ask Asad: How do I deal with severe depression and suicidal thoughts? Ask Asad: I have a constant fear of losing my wife and my child. How do I overcome this? Ask Asad: Am I going to be cheating on my late fiancé if I decide to move on and marry someone else? Ask Asad: My mother doesn't like my choice of a potential life partner, what should I do to convince her? Ask Asad: Am I wrong if I want more time from a person I am seeing for marriage? Ask Asad: I don't want to marry my cousin because she isn't pretty! 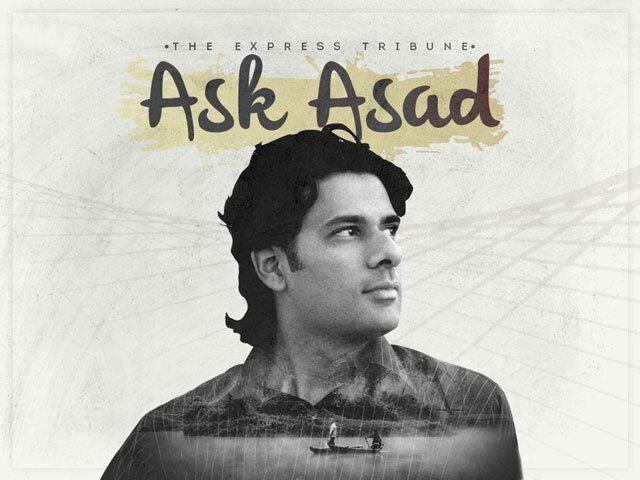 Ask Asad: Should I quit everything and go back to Pakistan? Ask Asad: I am obsessed with excessive cleaning, does that make me psychotic? Ask Asad: Is it okay to marry a man who is 19 years older than me and already married with kids? May-Septem­ber relati­onship­s (where the man is signif­icantl­y older than the woman) have their own specia­l challe­nges.